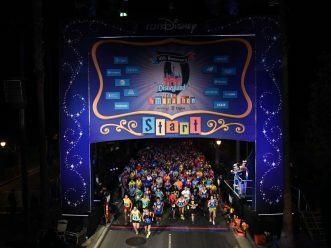 More than 32,400 runners will line up for races during the 11th annual Disneyland Half Marathon Weekend presented by Cigna, including more than 16,000 from California. Many runners are participating in more than one event, including more than 6,000 doubling their running fun during the 10K on Saturday and the half marathon Sunday in the Dumbo Double Dare challenge. Three previous Disneyland Half Marathon winners are competing again this year: female winners Momoko Tanaka from Japan (2015) and Jennifer Berry from Denver, Colo. (2014) and male winner Jimmy Grabow from Runner Springs, Calif. (2012 and 2013). In addition to the half marathon, the weekend’s events include the Disneyland 5K, the Disneyland 10K, runDisney Kids’ races and the runDisney Health & Fitness Expo. All races take place at the Disneyland Resort in Anaheim, Calif. The media tent will be next to the finish line near the Disneyland Hotel. Thursday, Sept. 1, 2016 10:00 am – 8 p.m. Disneyland 5K – Sept. 2, Friday, 5:30 a.m.
Friday, Sept. 2, 2016 12:00 pm – 8 p.m. Disneyland 10K – Sept. 3, Saturday, 5:30 a.m.
Saturday, Sept. 3, 2016 10:00 am – 5 p.m. Disneyland Half Marathon Sept. 4, Sunday, 5:30 a.m.
U.S. Army retired Master Sergeant Cedric King, a decorated war hero from Fayetteville, N.C., who lost both legs during combat in Afghanistan, is running on behalf of Cigna in the 10K. King, who has run half marathons and marathons since losing his legs, earned numerous military commendations during his Army career, including the Purple Heart and the Bronze Star. Ellen Lem, an 89-year-old from Anaheim, Calif., is the oldest participant in the Disneyland Half Marathon Weekend. Turning 90 in November, Lem is running in the 5K along with her two daughters. Lem had a turbulent childhood in Asia that included fleeing war-torn Burma, living as a refugee in China and working as a volunteer for the American Red Cross. After those challenging early years, Lem sees the 5K as something she can finally accomplish for herself. Valerie Thiessen, from Fresno, Calif., is running in the 10K after having lost more than 110 pounds in a year. Thiessen set her eyes on participating in a runDisney race after she started a family weight-loss challenge last September. Thiessen is motivated to lose weight so she can live a longer, happier life. Media interested in covering the half marathon on Sunday must contact Disneyland PR by 5 pm Thursday for credentials and directions. Media must be on location no later than 4 a.m. on Sunday for live coverage of the start and finish lines.